Chesterton is a small, former mining village in Staffordshire, England. It is situated in the town of Newcastle-under-Lyme. Chesterton is the second largest individual ward in the Borough of Newcastle-under-Lyme. In the 2011 census, Chesterton's population stood at 7,421. 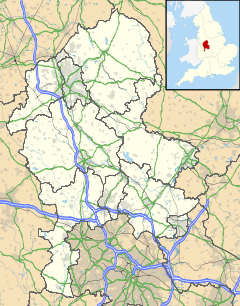 Chesterton was a parish in the Wolstanton Rural District from 1894 to 1904. Following that, it became part of the Wolstanton United Urban District until 1932, when it was added to the Borough of Newcastle-under-Lyme. The main employer in Chesterton was Holditch Colliery. The colliery employed 1,500 men and mined ironstone in addition to coal. Despite heavy investment in the 1960s and 1970s the colliery closed down in 1988, just three years after the end of the year-long miners' strike. Many of the miners transferred to nearby Silverdale Colliery, which itself closed down on Christmas Eve 1998. The current site of Holditch Colliery is now a large business park. There are four primary schools in the village: Churchfields Primary, Chesterton Primary, Crackley Bank Primary and St.Chad's Primary; and one Secondary school: Chesterton Community Sports College. Wikimedia Commons has media related to Chesterton, Staffordshire. This page was last edited on 20 February 2019, at 14:38 (UTC).